Oven Smoked Brisket, succulent meat that tastes like it has been smoking in a smoker for hours. 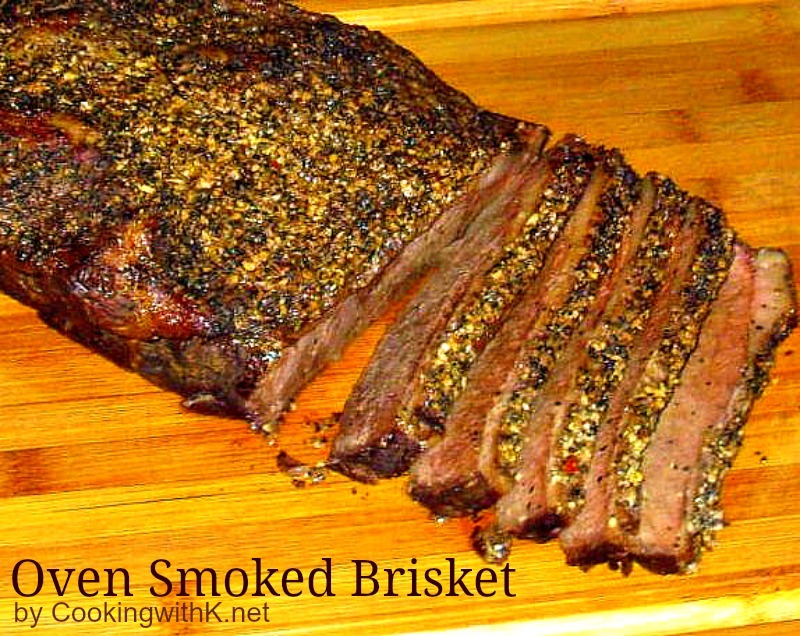 You don't need a smoker to do this With a dutch oven, slow cooker, or an oven, you can make great oven smoked brisket. Brisket was a new cut of meat you might say at our house as a teenager growing up. I remember as a teenager when my mother first started cooking brisket. She would cooked them in the oven at first and then later on when she got a smoker, she started smoking them. The best part about my mother cooking a brisket was not how she cooked them, but it was how she selected the one to buy. The briskets you buy in Texas are what is known as a packer cut usually—this means that it’s the full chest muscle, and most of the time covered with a generous layer of fat and weighs anywhere from seven to eleven pounds. Her secret to picking out an excellent brisket was if you could fold them in half then you were getting a lean one. Her theory was that lean meat folds, and fat doesn't, isn't that the way we are too (grins). So it worked for her then, and it works for me now. You can see me standing at the meat counter checking all the briskets by folding them until I find a lean one. Some people look at me funny, and I have even had some to ask me what am I doing? I have to say some agree with me, and some don't, but I leave with a terrific brisket. Trim brisket of excessive fat, but leave a nice layer for a wonderful flavor. Place brisket in a large roasting pan or in an extra large Ziploc bag. Pour liquid smoke over brisket and seal tightly. Place in the refrigerator for 6-8 hours or overnight. Remove brisket from the refrigerator and let sit for 1 hour. Preheat oven to 275 degrees F.
Season brisket with salt and sprinkle Grill Mate Steak Seasoning on top of the fat side covering all the way to the edges. Place brisket fat side up on a rack inside of a roaster pan and cover with foil. Bake in the oven for 3 1/2 to 8 hours depending on the size. Remove from oven and transfer to a cutting board and let rest for 15-20 minutes before slicing. Add some cold water to the bottom of the broiling pan before cooking. It will cut down on smoke and grease from the meat and make clean up easier. I think it is quite clever to fold the brisket. I will have to remember that too. My grandmother taught me the same thing. She showed me how to fold the Brisket in half to make sure I found a good one and also how to cook it in the oven. I have never heard of anyone else doing it this way. We are born and bred in Texas too. Your blog is a joy to read. Thanx so much for sharing!